One of the first questions we asked was, “How do we get the highest quality photos?” The obvious choice was to use a DSLR instead of the webcam. The next question is how do we provide lighting? We consulted photographers amateur and professional. The most convenient would be to use a standard flash embedded into the booth. It could be sleek and the design could be monolithic. But what about those who want to use an umbrella and do a top reflector or even? We thought about it and in all honesty most people would have different equipments budgets and setups so we decided the design should support both. A spot for an internal flash and mounts for external flashes. We wanted to make the entire system robust. We started looking around the net for materials people were comfortable with. 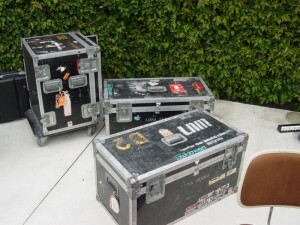 In productions road cases are commonly used and they sure can take a beating. The textured abs can also help to hide scratches. So my biggest fear when making the first booth was the software crashing. The code was written for a windows PC and the blue screen of death was in the back of my mind the whole time. I considered rewriting the software in Processing/Java then it would be cross platform and be able to operate on Mac, PC and Linux. Then it hit me, lets do an embedded system. 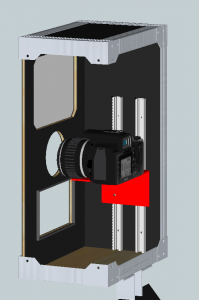 Lets design a custom set of electronics with no other function than trigger the camera and being an interface to teach the user how to use the photo booth. This one was easy. To make a booth more fun, just add props and people. Also add a very high quality display to show people the pictures. The target for this design was <30 pounds. The previous booth was 60 pounds for the open air booth. This new booth will have to be light because the camera flash and batteries will add some weight. We decide a podium style open air design is the best. It gets the job done and takes up the least amount of space. Since we removed the computer and we are using stock high end cameras the cost is actually much less. Also the long term cost is less because we do not have to worry about damaged PC parts needed replacement or OS updates and drivers since the design is embedded. 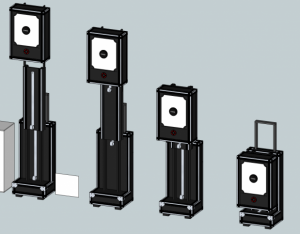 By using road case material the booth will be very strong but wont be as expensive or heavy as a stainless steel box. Keeping it simple has many advantages. You don’t have to worry about languages or the technically inept. Most people just want a button and where to look. 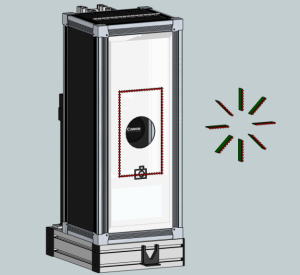 We decided we should add a big flashy glowing button and a large LED effect to tell the user where to look. For the person setting it up since we are planning to remove the computer there is no complicated setup. Just prep the camera and plug it in. We should even make the entire photo booth battery powered. Then we don’t even need a heavy extension cord and we can position the booth anywhere we wanted. Since the booth will be self contained, everything can be setup at home and then placed and ready to go. If we do print it needs to be a reliable system. It needs to hold enough prints for a 4 hour wedding, enough ink and not jam. That’s 1 photo every 30 seconds. 4hrs*60mins*2 prints per minute = 480 prints. No normal printer will be able to handle the load. At some point you will need to change the ink or add paper. We found this great list of high end printers here. One of the more popular brands is Hiti for photo booths. There are even some really cool Polaroid inkless technologies available like ZINK, they use various thermally activated inks to do color prints. Some even operate on only batteries. Unfortunately those printers are still very expensive and do not support the capacity we need. The starting range of a premium printer is $500-$1000 this makes us seriously wonder if printing is really necessary. We decided to test it and see if anyone would miss it. 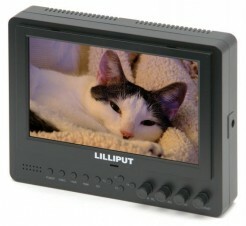 It would keep the booth battery powered and with a screen to view the photos, we don’t think anyone will miss it. Especially since most people will upload the photos onto Facebook immediately. We’ll see soon enough. 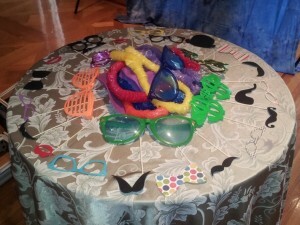 Stay tuned for my next post “Gen 2 Photo booth – Design” where we try to go from concept to design. Will we meet all the requirements? Probably not, but we will try our best.